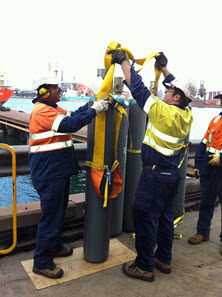 With a commitment to delivering superior safety practices in the workplace, Tyco Integrated Fire & Security staff working at the Port Kembla Coal Terminal in Wollongong, New South Wales have reinvented the way heavy lifting of cylinders is conducted on site. The Port Kembla Coal Terminal has a stringent fire safety protocol in place and as part of its ongoing maintenance, requires up to nine very heavy cylinders to be lifted from ground level to a height of 20 metres on a regular basis. The cylinders each weigh 121 kilograms. The Inergen® gas cylinders are critical components of the fire safety system that is installed at Port Kembla, which includes 28 fire panels and more than 100 Inergen® cylinders located in switch rooms throughout the terminal. Together with Tyco Integrated Fire & Security’s Technical Services team, the Wollongong branch came up with a creative solution to address heavy lifting. They designed a specialised ‘Inergen® Cylinder Lifting Harness’ that enables heavy cylinders to be moved with the use of a crane. “Developing the new safety system was not a straight forward process. It took three months of brainstorming, sketching, consulting and locating a suitable manufacturer before a prototype could be produced. It then took extensive testing and trials, with a number of improvements and modifications, before the harness could be manufactured and put into use,” explained Trent Green, Fire Alarm – Leading Hand at Wormald’s Wollongong branch. The team’s efforts have now paid off with the Inergen® Cylinder Harness improving workplace safety at the site. The team has also been formally recognised by Port Kembla Coal for their safe methods of work and efforts in developing the solution. There are now big plans for the harness. It has subsequently been approved as a product and incorporated into the Tyco Fire Australia Cylinder Handling Procedure. Several of Wormald’s fire branches in Australia have also purchased the harness and it has been adapted for use in other industries. There are now three new harnesses designed to lift C02 cylinders and two different size harnesses which are being used to lift cylinders onto ships with low ceiling spaces.